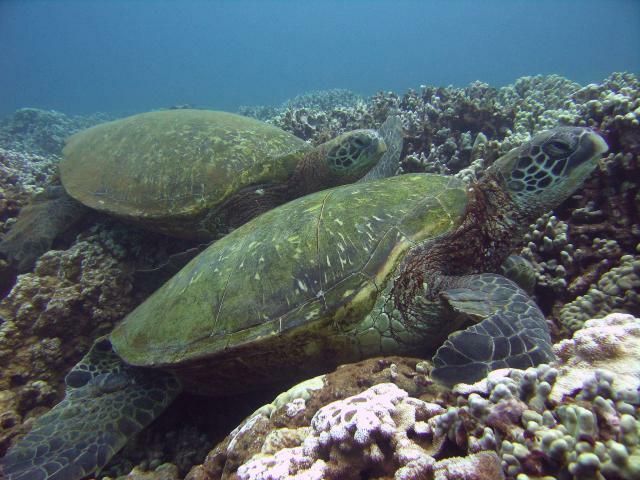 Back in 1993, we vowed to write a book about the Turtles of Honokowai. In 2001 we began the actual manuscript, only to be interrupted by Fate (see our Prolog to 2002). In 2003, we wrote the promise to complete the book onto a small dive slate and tucked it under The Battery at Reef 2. We continued to write and work on the book. Summer 2006 is truly a special summer. We found a publisher for our book, University of Hawaii Press, and we couldn't be more delighted. On our first dive of this summer, we returned to The Battery, pulled out "The Promise", by now nearly faded from the dive slate we planted in 2003, and took this picture. This summer will prove to be a busy one. We have to exercise, dive, kayak, and have a revised manuscript, promised to the publisher for the end of August. And... it's 5690's summer to nest again. That means we'll be keeping night watches for Mama nesting, as well as babysitting her babies. Nights out on a beach. We made our first dive on July 2nd. As we snorkelled out, we were immediately struck by the murkiness of the water. It took just seconds after our first descent to understand why. We saw a blanket of red silt coating the ocean floor. As we kicked deeper, we discovered just how extensively the red silt had collected. We realized it was 1994 all over again--meaning at the best of times we'd be diving in a perpetual haze. As we got to Makana's Ridge we were shocked at how deep and pervasive--how many tons of silt and soil had been deposited since 2005. Slowly turtles came into view. Most who saw us took no notice. Old acquaintances just continuing to do what they were doing. Resting mostly. We conducted the summer's first roll call. The greatest surprise and source of joy was seeing Fred after so many years. Some turtle's faces you just never forget and Fred is one of them. When we first meet Fred in 1992 he/she was the tiniest turtle we'd ever seen. What a difference fourteen years make! Fred (foreground) is all growed up. What can we say? Last year it took us three weeks before someone called the Maui Fire Department to come and rescue us. This time they showed up on our first tour out. Perhaps it's because we set out just to watch the sun set. Perhaps it's because we stay out long after the sun's gone and so is the last hint of dusk. Perhaps it's because we're out there in the deep of dark watching the stars and the moon. Either way, we're rinsing off from our first kayak trip and two people in uniform walk up to us and ask if we were "the kayakers." Then they tell us they received a call of kayakers in trouble. Etc. etc. We thank them for checking up on us and wish them a good night. So, five days later. We're once again enjoying the peace of dusk and the first twinkle of stars when we hear the chop chop Chop Chop CHOP of an approaching helicopter. We speculate why they appear to be showing such interest in the water. Peter suggests someone has once again called for a rescue. Ursula says surely that can't be for us! The helicopter is now so close to the water it's whipping froth. It's beak points to us, then it presents itself sideways--all the while lights on, hovering and noisy. We decide to turn upcurrent and paddle to show them we have control of our kayak. Then we turn around to paddle back home. The one thing we do not do is wave. They lose interest in us and now. more urgently, sweep the waters to the north. There's no doubt they're looking for someone to rescue. So, readers, we haven't been using our kayak our first full week and we've had the Maui Fire Department and a rescue helicopter trying to rescue us. 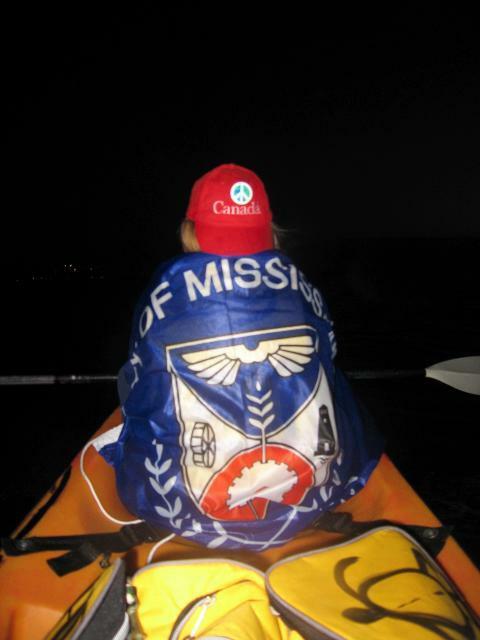 Ursula wraps herself in Their Evil Empire Flag as we drift back to shore after a successful kayak night out. We say "successful" because on this occasion no fire department or rescue helicopter tried to rescue us. We say "Their Evil Empire Flag" for reasons that will become obvious when we finish writing "The Legend of Their Evil Empire Flag". We were concerned about being the cause of rescue calls, so we called the Maui Fire Department to explain that we were often out on the water at sunset, that we always carried an emergency location transmitter, and described our kayak to them so that they would know know that we weren't having an emergency. They thanked us for our call but explained that no matter what, they had to respond to every call. This makes sense, of course. It also made us pretty happy to hear, actually. In the course of our call, we mentioned the rescue chopper. We were pleased to be told that the helicopter probably wasn't called out because of us. Apparently, there is a monk seal in the area (maybe the same one we saw last year) and someone probably thought it was a swimmer in distress. Well, we know that when a monk seal is flapping an eel around, from a distance it could easily look like a swimmer thrashing and waving for help. So now we don't feel so guilty. We do appreciate that the Maui Fire Department is on the job. We also appreciate that people are watching the water and reporting what they feel could be emergencies. Better a thousand false alarms than one unreported tragedy. Our second dive was memorable. 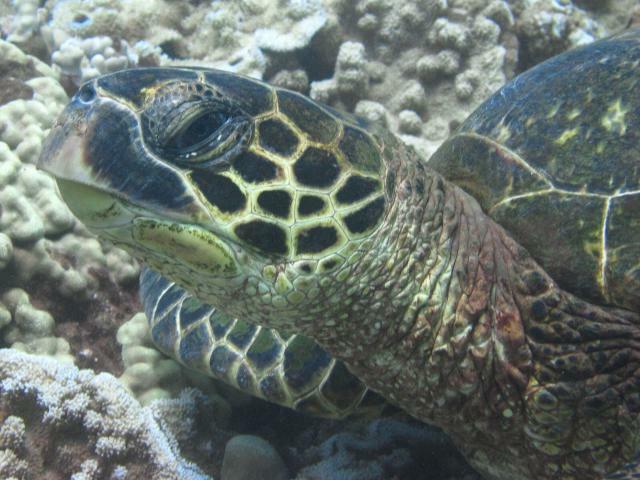 We resighted two tagged females: 605C, who we've known since 1995, and a turtle we've known since 2001: Hulali, 612C. Good to have them home this summer. The real surprise and source of happiness showed up early in our dive. Peter waved to get Ursula's attention and pointed to a turtle. Ursula immediately recognized her as Wana. JOY! Wana was missing all last summer. That wasn't what Peter was pointing at, however. At the rear of Wana's shell were the faded remains of a mototool marking. Now we knew for certain why Wana was away last summer. She was busy making baby honu at East Island! We photographed the mototool and sent the image to George Balazs, head of Marine Turtle Research for the Pacific Islands Fisheries Science Center. George agreed that two of the markings are a 7 and a 7. That meant Wana could only be either Turtle 177 or 277 of the 2005 nesting season. He is now examining the records of these two turtles to help us identify which one is Wana. All that remains of Wana's 2005 mototool marking. The last two characters are almost certainly 77, but the only trace of the first number is a dot. After exactly one week here, we'd only logged in two dives. This is really the first summer where we've felt that age is creeping up on us. Admittedly we've had errands to run across-island. At least one day was cloudy, which would mean the hazy water here would be absolutely gloomy. Good for hiding sharks in! We are still getting about 5 new turtles up a night. More than half of these are untagged. A good sign - new girls coming to East. 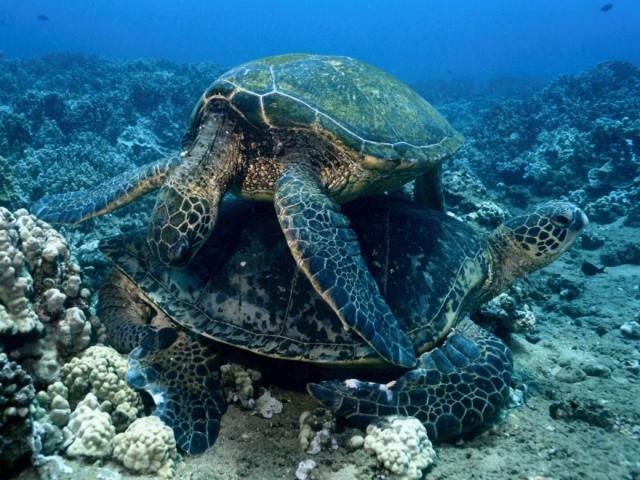 There are also 6 "special turtles" that migrate from a monitored dive site on Maui. The couple that monitors the turtles catalogs their dives on this website (http://www.turtles.org/). The turtles names we have seen here are Raphael, Alaeloa female (tag # 4136013879), Mendelbrot, 417T, Shredder, and Tiamat. One Honokowai female looms large in her absence here. Tutu, who we've known since 1990. Admittedly, it's been only two dives but she's not in her usual place at Reef 2, and George's East Island team hasn't sighted her nesting. The first week here is as good a time to start worrying as any. We're worried about Tutu. As we mentioned, we've known Tutu since 1990. One other turtle, Nui also has a Honokowai residency we can trace back that far. During our first and only day-time kayak snorkel trip we resighted Nui, and Peter took this portrait of our old friend. 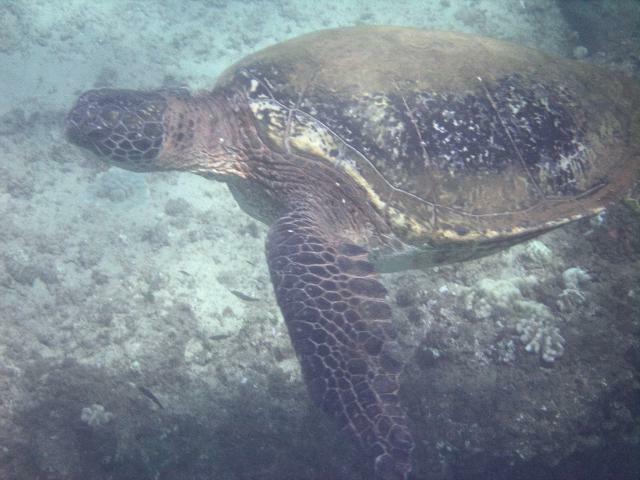 Our first sighting of Nui in 2006, taken while snorkelling at Hoaka. This gives Nui the distinction of the longest residency of any Honokowai honu, at least until we locate Tutu: sixteen years since first sighted back in 1990. It's pretty certain as well that Nui has taken the summer off from migration duties. Nice to have him here for the summer. Back in 2004, we met a strange turtle at Kuamo'o. We immediately suspected that it was a green-hawksbill cross, which George Balazs later dubbed a "honubill." We called the turtle "Wai?" (yes, including the question mark) which is Hawaiian for "Who?" because we weren't sure who we were dealing with. Later that summer, George was visiting and met Wai? 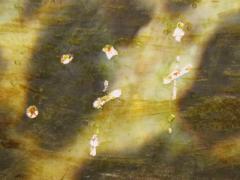 He collected some barnacles with the hopes that enough DNA material would cling to them to allow a test to prove Wai? was indeed a cross, but alas, it didn't work out. Unfortunately, we didn't see Wai? again that summer, or at any time in 2005. 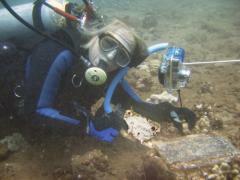 So there we were at Reef 2, which is a heck of a long way from Kuamo'o, and who was sitting on the corals? None other than a strange-looking duck who could only be--Wai? Wai?, the oddest turtle we've ever met. Indeed it was. When we got back ashore, we quickly checked our database of profiles, confirming beyond any doubt that Wai? was visiting Reef 2. In fact, we were astounded that the left profile from Reef 2 duplicated almost exactly the left profile we'd gotten back in 2004. They look as though they were shot within seconds of each other. We are keeping our fingers crossed that Wai? will hang around and we'll see her (him?) again. With bit of luck, perhaps George will get the opportunity to try the DNA test again. It would be really exciting to prove what we are already pretty sure of, namely that Wai? is a real honubill. The sighting left us in awe once again of the astounding luck we have sometimes. What are the odds that Wai?, a turtle we saw only twice at Kuamo'o, would show up at Reef 2, literally miles down the coast--and that we'd be out there to make the sighting? Time to buy lottery tickets! Ying. Yang. With the good news comes the bad. "Large, female turtle struck by boat, SCL 86.9cm, weight 257.0lbs. Initially seen alive at Pohaku Beach Park with air escaping the wounds when it breathed, later found dead near Noelani Condos, in Kahana." He wanted to determine if we knew the turtle. We checked our database and confirmed a right profile match and asked for a left. That matched too. With sadness, we reported to George that we knew the turtle. She gave us several special memories, including one of the best photos we'd ever taken. Back in 2003 one of our big males, Blue, was resting at the bottom minding his own business when this turtle decided Blue looked a bit too peaceful and proceeded to sit down atop him. 2003 Turtle 46, bugging Blue. 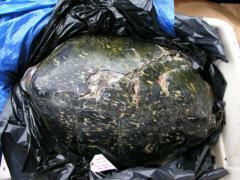 2003 Turtle 46, killed by a boat prop. We'd like to end this weekly summary on a happy note but no, we believe that it's only fitting to emphasize the danger boat propellers pose to sea turtles, even though the rate of such incidents is fortunately low: just 3% of strandings, as documented by the Sea Turtle Stranding Research Network in the Hawaiian Islands.